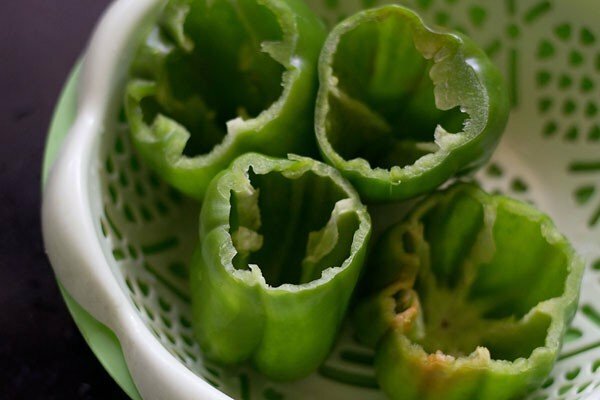 bharwa shimla mirch recipe - delicious recipe of green bell peppers stuffed with spiced potatoes. 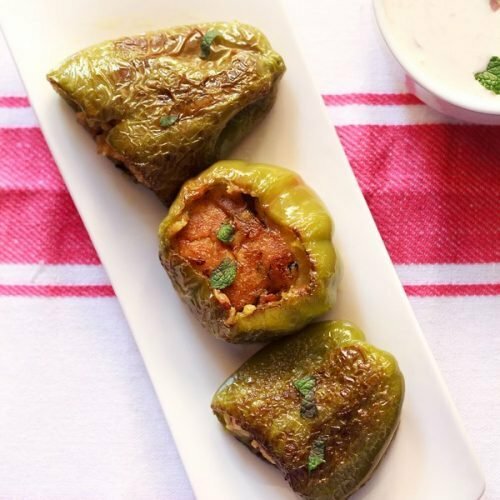 stuffed capsicum recipe with step by step photos – this is a punjabi style delicious stuffed capsicum recipe. 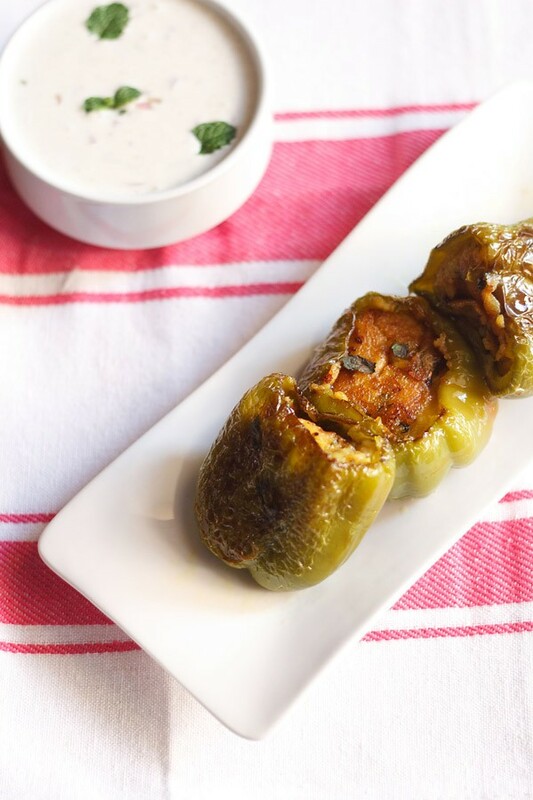 in this recipe, capsicum are stuffed with spiced mashed potatoes. 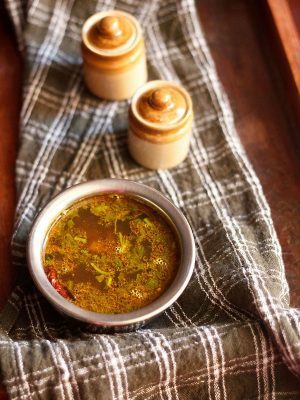 this punjabi bharwa shimla mirch recipe is how i make this dish at home and is liked by everyone. sometimes i also add green peas to the potato stuffing. 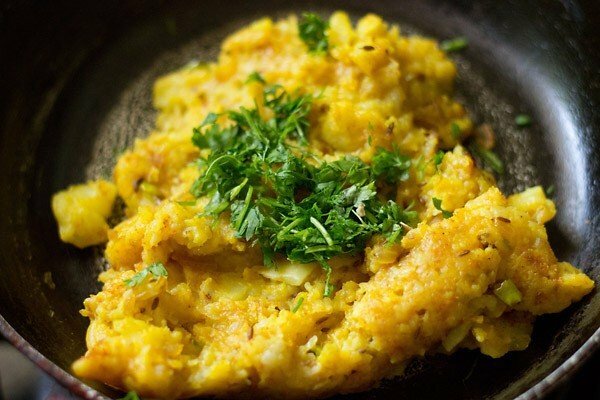 there are many variations of making the stuffing and even with different ingredients like paneer (cottage cheese) or besan (gram flour). most of the times i bake the stuffed capsicum. but in this post, i have mentioned on how to cook the capsicum in a pan, as i do get a lot of requests for making stuff without an oven. however, if you do have an oven, then bake the capsicum. baking is easy and effortless, than sauteing & cooking them in a pan. 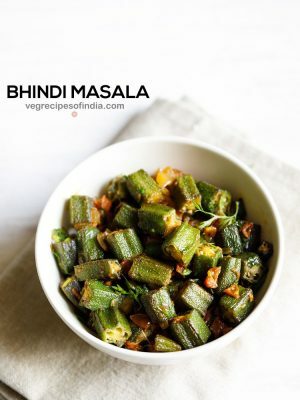 the bharwa shimla mirch goes best with rotis accompanied by a raita. 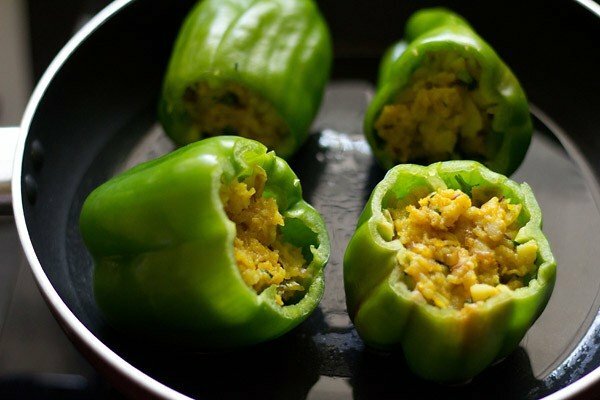 you can also serve these stuffed capsicum as a side dish. 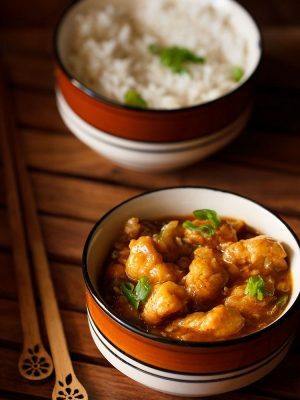 this dish also makes for a good tiffin box lunch. first, boil the potatoes till they completely tender and cooked thoroughly. peel and grate the potatoes. keep aside. slice off the tops of the capsicum. remove the seeds. rinse them in water and pat dry with a kitchen towel. keep aside. saute the onions till translucent. add chopped green chilies. stir and then add turmeric powder, red chili powder, asafoetida. stir again. add the potatoes and mix everything. saute the potatoes for 2 mins and then add garam masala powder, dry mango powder and salt. with a spoon or with your hands, stuff the potato mixture in the capsicum. if baking, then brush or rub oil outside the capsicum, before you stuff them with the spiced mashed potatoes. 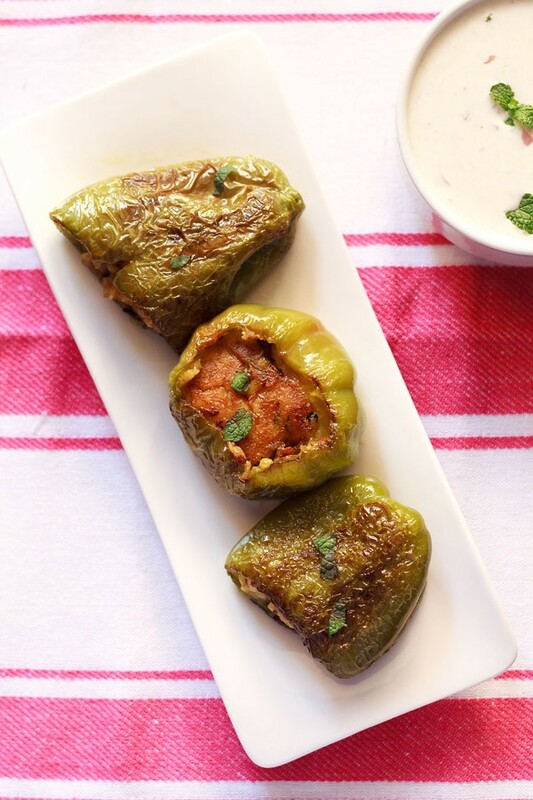 now you can bake the stuffed capsicum in an oven or saute in a pan. 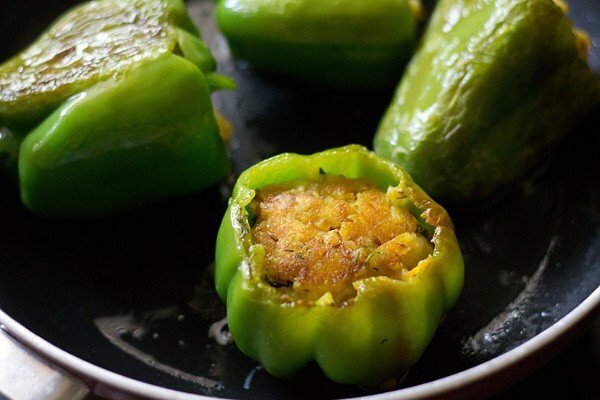 you will have to check often after every 5 to 6 mins and keep on changing the sides of the stuffed capsicum, so that all sides are cooked well. check, turn the sides and cover the pan again. continue to check, change the sides and then cover again till the stuffed capsicum are cooked well. it took me about 25 mins to cook these on a low flame. 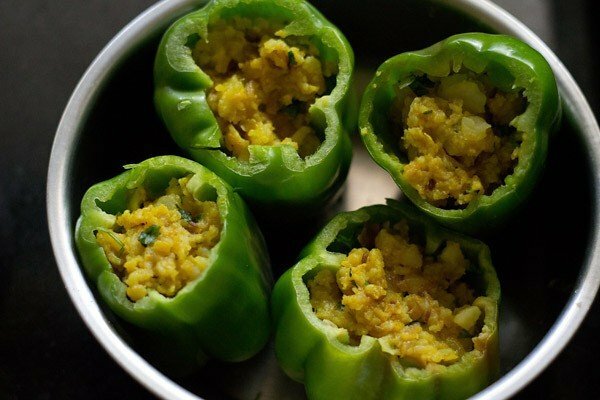 garnish with coriander or mint leaves and serve these potato stuffed capsicum hot or warm with rotis, bread or as a side dish. 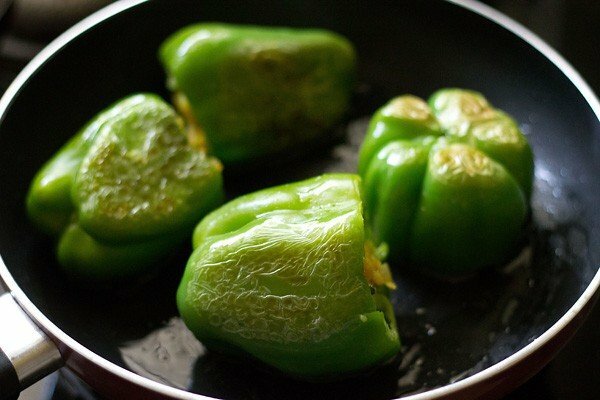 place the stuffed capsicum on a baking tray and bake at 200 degrees C for 20 to 30 minutes (oven temperatures vary, so keep an eye) till the capsicum has become golden and wrinkled. 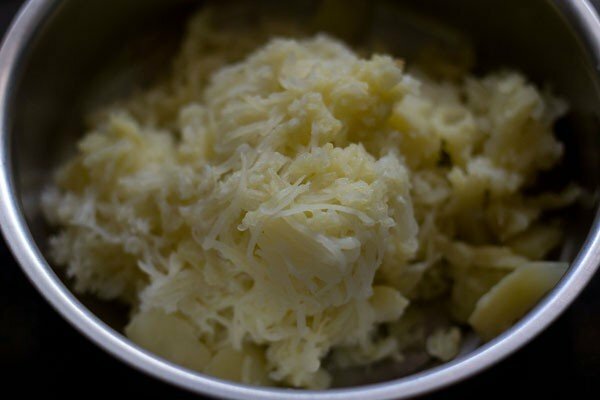 you can also top some grated cheese on the potatoes and then bake. 1. first, boil the potatoes till they completely tender and cooked thoroughly. peel and grate the potatoes. keep aside. 2. slice off the tops of the capsicum. remove the seeds. rinse them in water and pat dry with a kitchen towel. keep aside. 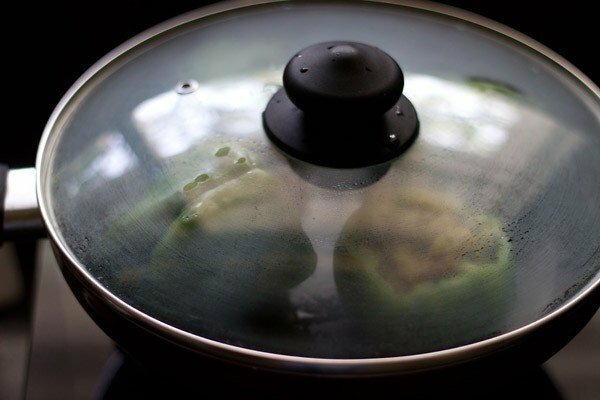 3. in a small frying pan, heat oil. 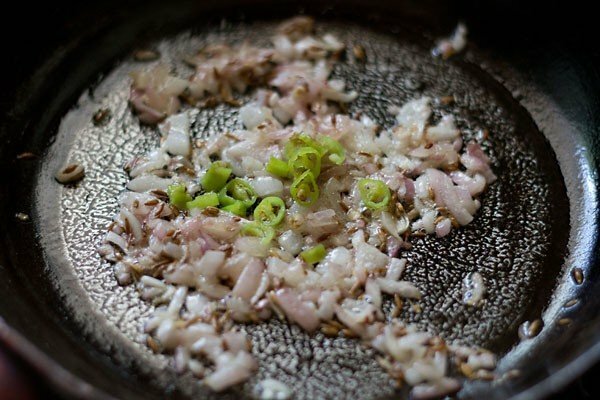 fry the cumin first and then add chopped onions. 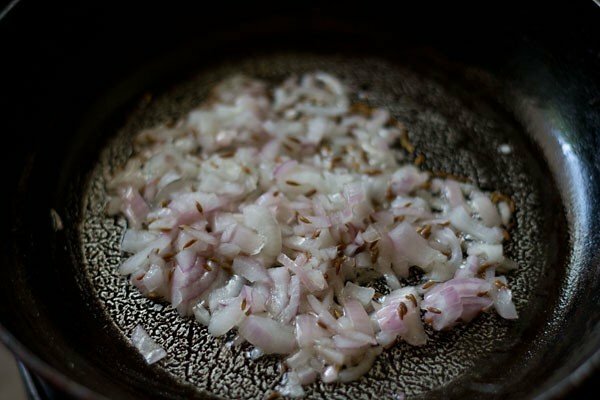 4. saute the onions till translucent. add chopped green chilies. 5. stir and then add turmeric powder, red chili powder, asafoetida. stir again. 6. add the potatoes and mix everything. 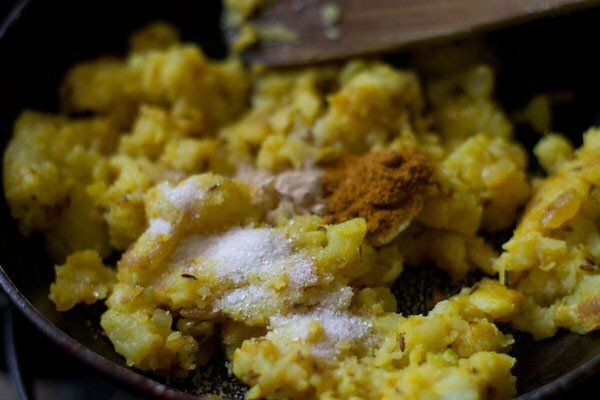 7. saute the potatoes for 2 mins and then add garam masala powder, dry mango powder and salt. 8. stir well and then add chopped coriander leaves. 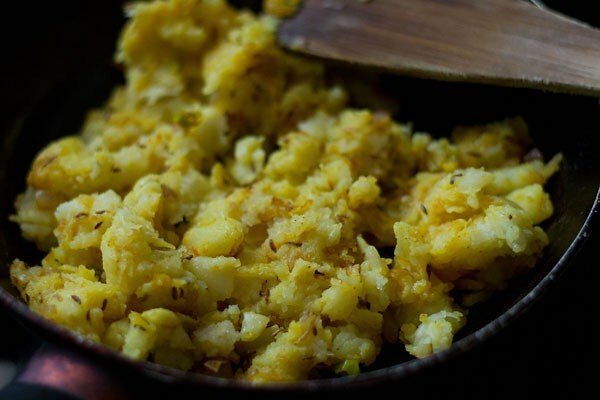 mix again and let this spiced potato stuffing become warm or cool down. 9. with a spoon or with your hands, stuff the potato mixture in the capsicum. 10. now you can bake them or saute in a pan. i have mentioned the baking instructions in the recipe details above. 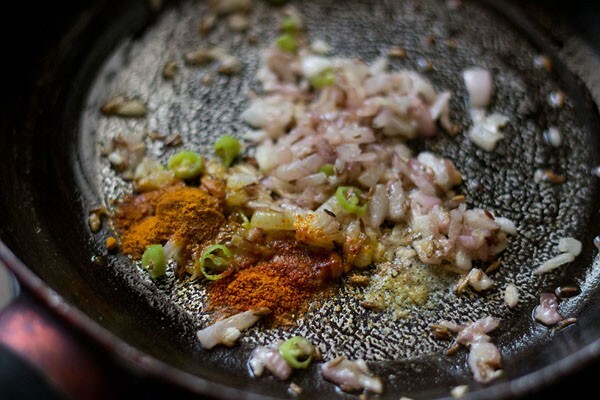 heat oil in a pan or kadai/wok and place the stuffed capsicum in the pan. 11. cover the pan and allow the stuffed capsicum to cook on a low flame. 12. you will have to check often after every 5 to 6 mins and keep on changing the sides of the stuffed capsicum, so that all sides are cooked well. check, turn the sides and cover the pan again. you also have to place the open potato side touching the pan. 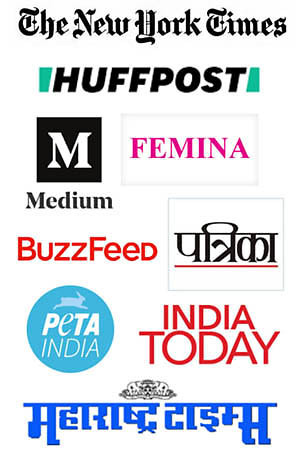 in the below pic, you will see the various sides getting cooked. the capsicum will get golden and wrinkled. i usually cook the bell peppers thoroughly. 13. continue to check, change the sides and then cover again till the stuffed stuffed are cooked well. it took me about 25 minutes to cook these on a low flame. 14. garnish with coriander or mint leaves and serve these potato stuffed capsicum hot or warm with rotis, bread or as a side dish. 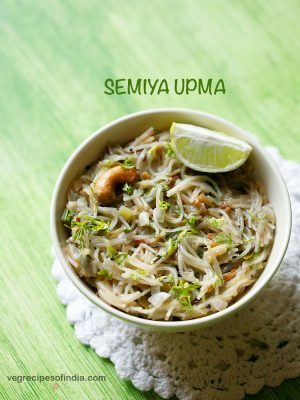 hi dassana ur recipestation r wondering and I always prefer them first.same I did it with this and it was awesome. thank kayanat for sharing this feedback. glad to know. 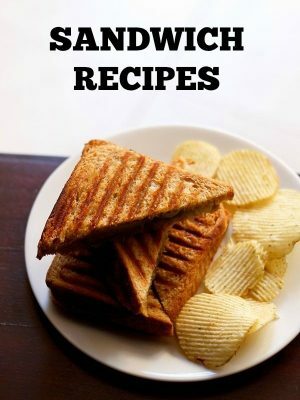 Hi, I’ve been following your recipes for a few months now and they are scrumptious each time. Never have I come across a recipe that has failed to impress. 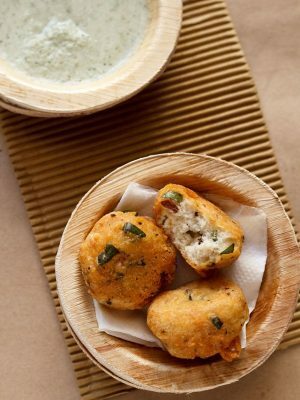 They have a distinct home-cooked flavour which chefs like Sanjeev Kapoor and Pankaj Bhadauria miss. This is the type of cooking that leaves you content and full. Just like eating out of mom’s hands. I appreciate the hard work and heart you put in your recipes and it shows. Thank you. Welcome Amandeep. Thanks for your kind words and appreciation. Glad to know that you like the recipes and their presentation. Thanks Malkeet. Glad to know that you liked the recipes presentation. Looks tasty.But to make it healthy, what other veggies can i add instead of potato? 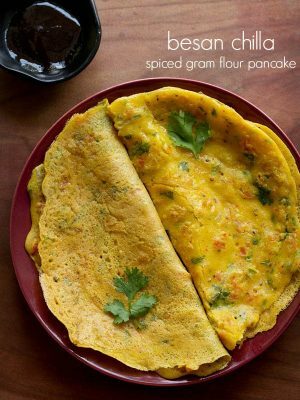 Sruthi, you can add grated carrot, green peas or corn. sunita, in microwave oven, use the microwave mode. you just need to cook for 4 to 5 minutes. thats it. grill and convection both use dry heat for cooking. in grill its just that the food is touching the heat source, whereas in convection the food is not touching the heat source. Lovely recipe as usual..love your blog and the fact that all recipes are so easy to follow. Your photographs are amazing. Thanks for making cooking so easy and fun!! pleased to know this shubhda 🙂 thankyou for your kind and encouraging words. you are always welcome. Hello,It is an absolutely sumptuous dish..Thanks a lot for sharing..i added some paneer as well,turned out great..Thanks once again. 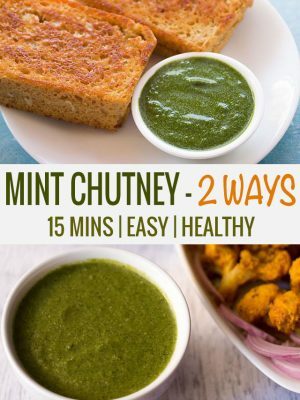 Very easy steps of receipe.